One thing about getting older, I've noticed, is that you get more tired doing things that before did not tire you as much. So after a weekend of working for about 30 hours, of which half of those hours in high heels, walking an uncountable amount of time back-and-forth between stage area and back stage at a huge fair center (note to self for next year: bring a pedometer!) it does take some days, not just a, to recover. But because work and moving apartments and such those days have not yet appeared; this is the first time in a week I managed to sit down by the computer and do internet-stuff from a bigger screen than the one in the palm of my hand. Phew! It's not really a pageant per se, that focuses on looks, but a modelling competition that values over all style and how to embody the modern pin-up, as well as modelling skills live and in front of the camera. The pin-ups this year were between ages 18 and 35; the age range is usually quite wide, as is the style of the contenstans. We produced the final event with all it's hundreds of bits and pieces and also help coach (=calm, mostly) the girls for it. As said before, I've never been much for competitions myself, but as one competitor put it: it did not feel like a competition; more like a pin-up camp. All contestants usually become great friends, plus get a lot of new opportunities via the events around the competition. Our lovely ladies on stage of the first round, that they get to style themselves. @Nancybites snapped this one of us. 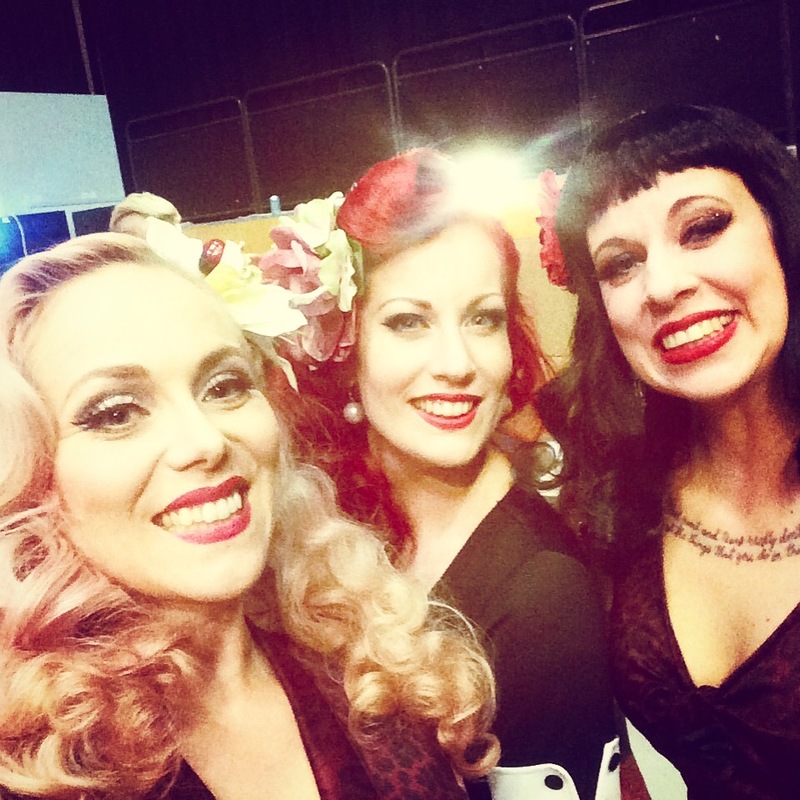 Backstage with the girls before the second show of the day. We had one go-go themed round and Eija sew these amazing groovy outfits our of vintage materials for the girls! So much want there! After the show with our winner Cherry Liqueur! 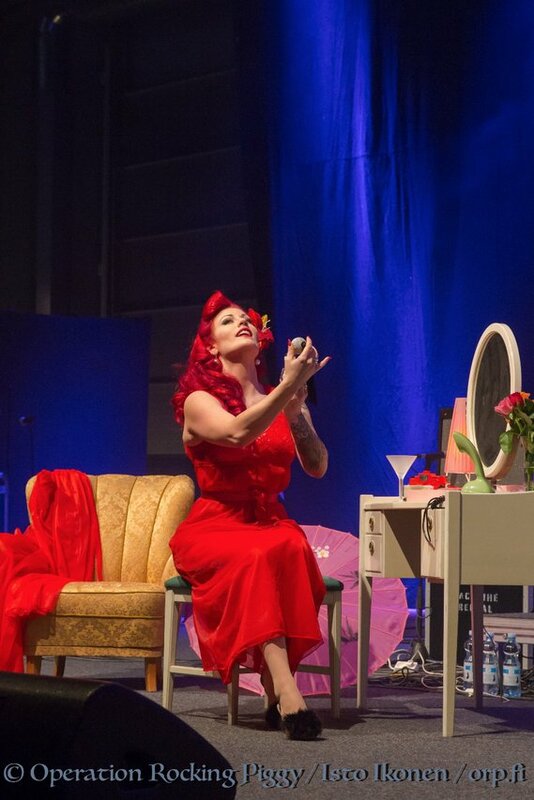 We will produce the Pin-Up Finland 2017 finals again next year, and also work on the photoshoots and other happenings around the event, so if you want in as a sponsor or to see your products featured throughout the summer season do get in touch. Photos by Harri Antikainen and Operation Rocking Piggy. so much wonderful outfit inspiration in all these photos! I especially loved your red shorts with the fringing. Did you make them? I made something that has a similar look yesterday for a space costume, though its actually silver fringing attached to a belt as a skirt that stops at the hips on either side, open at the front (with a black velvet bodysuit with silver stars all over it underneath). I'd love to see the back of your shorts to see how the fringing is designed on them! LOVE fringing! Samala: I love fringing too! :) your space costume sounds great! The shorts are not selfmade; they are from Booty and the Geek! Super comfy and well-fitting. The fringe goes like a peak or triangle in the side.